Following months of speculation, Congress has leaked plans for a sweeping reform to U.S. sports betting, laying out plans for federal oversight as well as a mandate for sportsbooks to use league-sanctioned data. 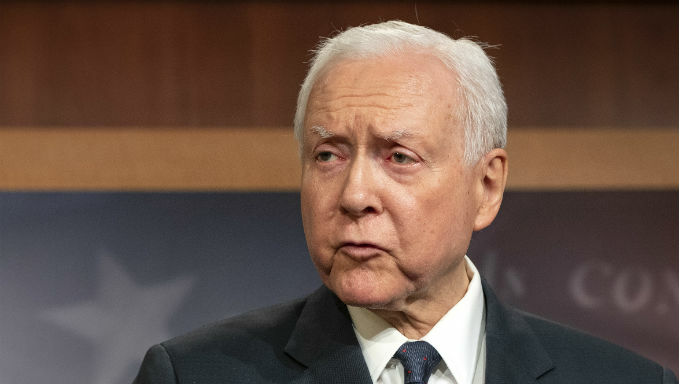 Championed by Utah Sen. Orrin Hatch, a longtime gambling opponent, the bill faces significant obstacles in Congress, particularly from a growing number of states that have or plan to create their own regulations. ESPN reports the bill would require the U.S. attorney general’s office to approve any state-sponsored sports betting regulations. It remains to be seen how that would impact the eight states that take bets now, or the handful of others that may do so in the coming months. Some industry observers believe this federal oversight may sink the bill politically before it gains any traction on Capitol Hill. State legislatures are unlikely to support another level of regulation and congressional representatives from gambling-friendly state are also unlikely to agree with further restrictions on their home jurisdictions. A layer of federal approval may also run afoul of the Supreme Court ruling earlier year that struck down the federal ban in the first place. The court ruled federal restrictions violated the 10th Amendment by commandeering the states’ rights to govern themselves. An approval requirement from a federal agency would assuredly be challenged in court and could fall under that same ruling. Aside from attorney general approval, the bill also lays out federal-level solutions to major issues in the sports betting legalization process. The bill requires all sportsbooks to use official data sanctioned by sports leagues until at least 2023. The leagues have pushed for this requirement as it would be a possible financial boon if the sportsbooks were in turn required to purchase the data from the leagues themselves. Current legislation doesn’t include so-called “integrity fees,” which sporting organizations have also sought. With sports betting more readily available in the wake of the Supreme Court decision, sports leagues argued they needed a portion of betting profits in order to combat outside corruption. This request was largely dismissed by state legislators across the country, and has been mostly abandoned by the leagues. None of the eight states with legal betting, or any of the nearly two dozen considering doing so, have seriously considered a cut of revenues for leagues in order to protect the “integrity” of games from gambling. Leagues now wrap their pitch around fair compensation for their data, which would be bolstered by Hatch’s bill. Other facets would likely prove less controversial. The bill calls for a federal “clearinghouse” to monitor bets. This could help combat suspicious betting patterns or nefarious external influences on competitions, which would be to the best interest of gambling purveyors and the leagues alike. It would also drastically reform the Wire Act of 1961, a thorn in the side of sports betting expansion. The current act prevents betting across state lines, but Hatch’s bill would relax that provision and allow sports betting operators to arrange compact with other states featuring legal wagering. In theory, this could match the online poker compact shared by New Jersey, Nevada and Delaware, which allows players in one of these states to play with operator services or players located in one of the other two jurisdictions. Passing any legislation is an arduous process on the Hill, especially in the nation’s contemporary political environment. That’s just the first of this bill’s problems. Along with likely political pushback from a federal oversight framework, the bill is losing its chief patron. Hatch, the Senate president pro tempore, is leaving office in January. A co-author of the original federal ban in 1992, he is one of the few remaining influential anti-gambling advocates in Congress and there appears to be no one stepping up to take that mantle. Senate Minority Leader Chuck Schumer has publicly called for a federal framework, but his office has yet to announce a bill and sports betting has not been a priority for many lawmakers in Congress. Schumer also represents New York, which has had a relatively progressive stance toward gambling in recent years and is seriously considering a sports betting legalization measure of its own in the coming months. As with most federal efforts, the Hatch bill has not been well received by gambling stakeholders. The American Gaming Association, the nation’s largest gambling advocacy group, came out against the bill. AGA Vice President of Government Relations Chris Cylke said the bill was “not necessary” in a statement earlier this week. The draft bill also faces a new set of elected officials when, and if, it’s even introduced in a Senate committee. Democrats will take over the House of Representatives in January with little inclination that it will support a sweeping federal regulatory framework for legalized gambling. Gambling stakeholders and affiliated parties are, obviously, scrutinizing any and all pertinent legislation emanating from the Capitol. But this effort, long touted by a leading anti-gambling voice in Hatch, seems unlikely to gain momentum, let alone passage, when the 116th Congress convenes in January.